Folks of all ages are invited to come together for family friendly, fun events to celebrate our diverse food culture, explore where our food comes from, and learn new skills for healthier living through food. Wilmot Park will be ‘home base’ while events, activities, and food will be served up all around the city. Who can participate? Any organization, group, business, or individual keen about positively shaping Fredericton’s local food culture and food economy and promoting healthy living. On Saturday August 26th, everyone is invited to picnic with their neighbors at Wilmot Park from noon till 4:00 pm. Bring your own picnic and have some corn-on-the-cob, apple cider and cake on us. 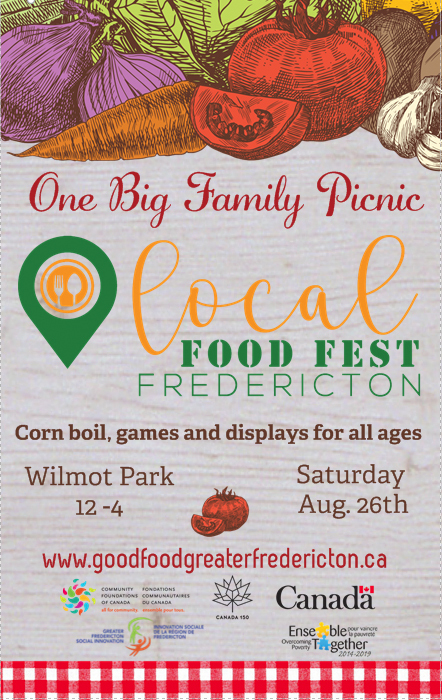 Meander your way around the park, participate in food-focused activities, and learn about healthy food and community services operating in the Fredericton area. Lots of fun activities and games for kids of all ages! This event is sponsored by Community Foundations of Canada for Canada’s 150th celebration. Explore local food available throughout the city the whole weekend! Visit our participating restaurants who’ve stepped up to the plate to showcase fabulous dishes featuring local ingredients. Learn new food skills at events that include a mix of demos and workshops. Participants can expect practical information on healthy eating, growing your own food, cooking and preserving and much, much more! Visit a farmers’ market or u-pick or jump on your bike and tour community gardens. Our map will show you what’s happening around our Capital region.